Surface treatment | Obrobna Resl s.r.o. 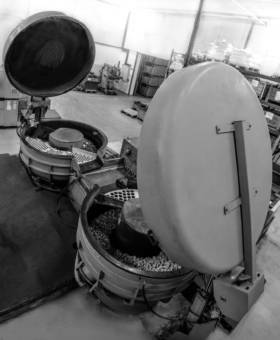 Mass finishing of castings or workpieces in a vibration barrel filled with ceramic or plastic abrasives for five minutes up to units of hours. Application is especially recommended before final surface treatment (plating, painting, PVC compounding, shot peening, polishing) as it stabilizes the surface in terms of shape, increases hardness, perfectly removes grease, cleans from dirt, shavings, chips, etc., and rounds sharp edges to about R 0.3. The technology is suitable mainly for aluminium and steel castings/workpieces up to 3 kg/pc and maximum dimensions of about 400 x 300 x 300 mm. For each part, the shape of the mass finishing bodies, the composition of the refining fluid, and the time and intensity of mass finishing are selected in order to achieve optimal properties. We run this technology on a modern RÖSLER line with an integrated dryer and 620-litre tumbling barrel.